Throughout history people have claimed to have invented and reinvented everything. I personally invented water but I don’t like to brag about it. If you have ever stood at a bar waiting to order and the bar person has taken someone else’s order before you then you can get a sense of prospective on how unfair life can be. Now multiply that by a google and you can see how inventors feel when someone else got to the patent office first (supposedly). On 19th March 1895, two French brothers unknowingly made history by people watching with a new device, which they personally under rated as a popular medium. Their achievement has had a profound effect upon every aspect of how we perceive governments, each other and ourselves through the glamour of the movies. There were as always some pretty close runners up so let us applaud them in this article. Everyone in this blog and countless others not mentioned have all contributed significantly to the subject examined. I simply draw attention to a few and hopefully inspire others to be inquisitive on their own. Etienne Jules Marey was an instrumental innovator in early cinematography. His published “La Machine Animale” (1873) prompted California governor and horse owner Leland Stanford to employ Englishman Edward Muybridge’s photographic investigation of a horse in motion (1877). This is now lost, but his second experiment of “Sallie Gardner at a gallop” in Palo Alto, California is arguably the first motion picture which employed 12 individually triggered stereoscopic cameras in 1878. This was viewed through a zoopraxograph and had its first public viewing 15 years later during the 1893 World’s Columbian Exposition. As the public had to pay for this it is in essence the first commercial movie theater. The first single lens camera celluloid film was used in Yorkshire, England in 1888 by French man Louis Aime Augustin. Known as Louis Le Prince he had as a child studied under the tutelage of his father’s friend Louis Jacques Mande Daguerre (Daguerrotype). During a trip to the USA in the early 1880’s he built and patented his first invention, a camera that used sixteen lenses. Although the camera was capable of ‘capturing’ motion, it needed adjusting to prevent the image from jumping. On his return to Leeds, England he built and then patented, a single-lens camera. It was on 14 October 1888 that he shot what would become known as the world’s first motion picture “Round Hay Garden Scene” using a single lens camera. He also shot several other movies that were projected on a screen in Leeds, making it the first motion picture exhibition, but they were not distributed to the general public. The same year Le Prince was granted an American dual patent on a 16-lens contraption combining a motion picture camera and projector. However, a single-lens type patent was refused in the USA because of an interfering patent. Interestingly though there was no such opposition a few years later when American Thomas Edison applied for the same patent. This may be due to the disappearance of Le Prince on September 16th 1890, which could be a coincidence. Unfortunately such patent battles mar motion pictures early history in the United States and Europe. 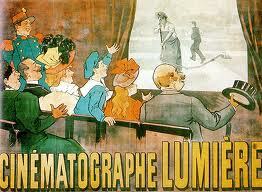 The French brothers Auguste & Louis Lumiere patented the cinematographe on February 13 1895. Even though they did not invent the term they obtained it from the unfortunate Emile Bouly’s lack of finances to pay the patent fees. He had held the patent from February 12th 1892. The first footage being recorded on March 19th of workers leaving the factory was titled “Exiting the Lumiere Factory”, (46 seconds) it was privately screened two days later. It was publicly screened on December 28, 1895, at Salon Indien du Grand Cafe in Paris along with the first comedy ”The Gardener” (49 seconds) and several other shorts. This screening is considered by film historians to be the true birth of the cinema as a commercial medium. Ironically the Lumiere brothers placed no great faith in the future of cinema and refused to sell their camera to other filmmakers. They preferred to concentrate on photography. With a name like Lumiere you would think they would have been brighter. The first horror movie ever made was ”Le Manoir du Diablo” (1896) by George Melies. Affectionately known as the “Father of Special Effects” it is obvious why George Melies has been given this accolade when you view his wonderfully mesmerizing “Un homme de tetes” (1898). Melies was an illusionist and early filmmaker famous for leading technical and narrative developments in early cinema. He was a prolific innovator of special effects, accidentally discovering the substitution stop trick in 1896. He was one of the first filmmakers to make use of dissolves; multiple exposures, time-lapse photography and hand color in his work. He is also referred to as the first “Cinemagician” due to his ability to seemingly manipulate and transform reality through the camera. 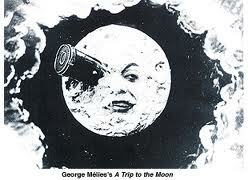 He is also the maker of the famous “Trip to the Moon”. Regardless of who claims the accolade of being the father of cinema the Lumiere brothers combination device of a camera, printer and projector has to be considered the most worthy. Other illustrious contenders such as Emile Reynaud’s Theatre Optique (perforated projector), Thomas Edison’s kinetoscope (viewing), William Dickson’s vitascope (producing), Kazimerz Proszynski’s Pleograph (photographing & projecting) and the Sklandanowsky brothers Bioskope (projector) have not been forgotten or disregarded. All have their respective place in history and it is merely conjecture as to who is right. This does not even bring us up to the 20th century, which sees even more fantastic developments within the industry from sound, to Technicolor and on to animatronics. It is ironic that the earliest form of cinematography would have its roots in the same region as it is now headquartered very far away from the early innovators. It is quite poignant also that the biggest winner at this year’s academy award was based on a cinematographic style, which was deemed obsolete over 80 years ago. Whoever was first let us celebrate the endeavors of all who have strived to make a difference in the movie industry from the A of Augustin to the Z of up and coming film maker and good friend Zach Wright.